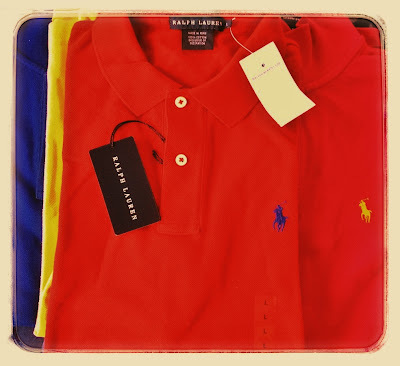 #TGIF ;-D Here's a novelized post of my recent Ralph Lauren Outlet Store shopping. Happy Birthday to me! For real, for my 2012 birthday, I went on outlet shopping spree from one area (Ontario Mills) to another (Cabazon). ;-D Oh my, it's a great day to shop last time as most stores were offering further reductions and additional discounts. Although, some of the items, like the classic RL polo shirts for men and kids were on regular outlet store selling prices, still lower than retail's but still pricey. It seemed that it's just my day then to shop, so here goes my victorious Ralph Lauren outlet shopping. 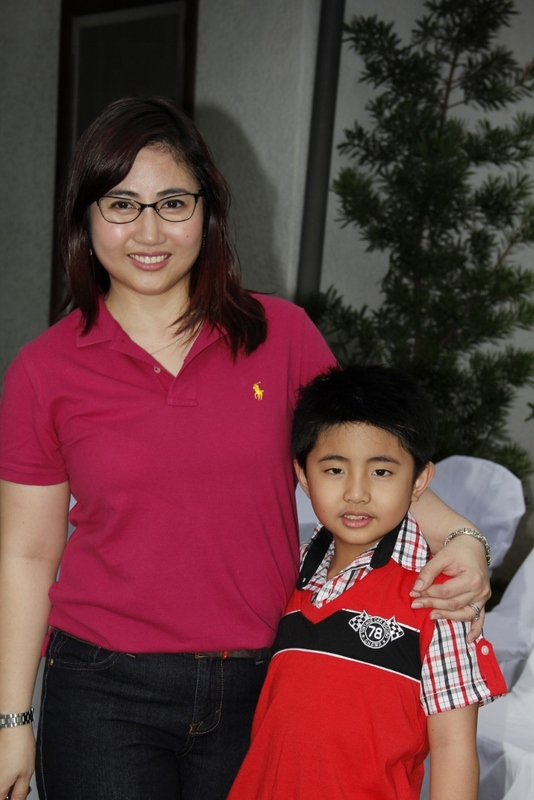 Skinny Fit Ralph Lauren Polo Shirts for female (not on male or kids) were on amazing after-Christmas Sale. As in, half the price. So I bought 5, then 2 more after. Here's a blue RL embroidered Pony logo on Red Polo Shirt. Color availability comes in fancy color names. But I will just go for the basic colors in this post. Here's what I had...Pink Pony on Green. 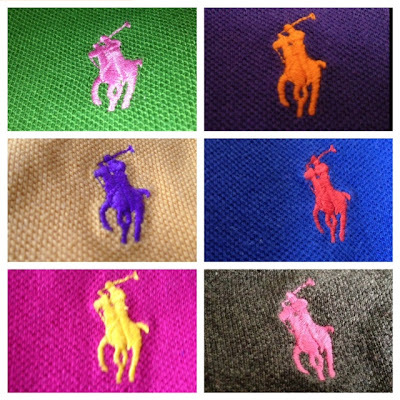 Yellow Pony on Purple, Purple Pony on Yellow, Red Pony on Blue, Yellow Pony on Pink, Pink Pony on Grey. There were limited colors available, black or white was not even available. I visited a retail Ralph Lauren Store, there were more color combinations available. For a Skinny Fit Ralph Lauren Polo, you have a two-button placket. Button with a Ralph Lauren notation. This button from the blue and grey shirts are a bit on the silvery/greyish shade. While most are pearl white color. Here are more details on Skinny Polo Ralph Lauren shirts. Please note that the skinny-fit comes out really body fit, so I had to go for a size bigger. #JustSaying *LoL Basically, this is Made in Peru. 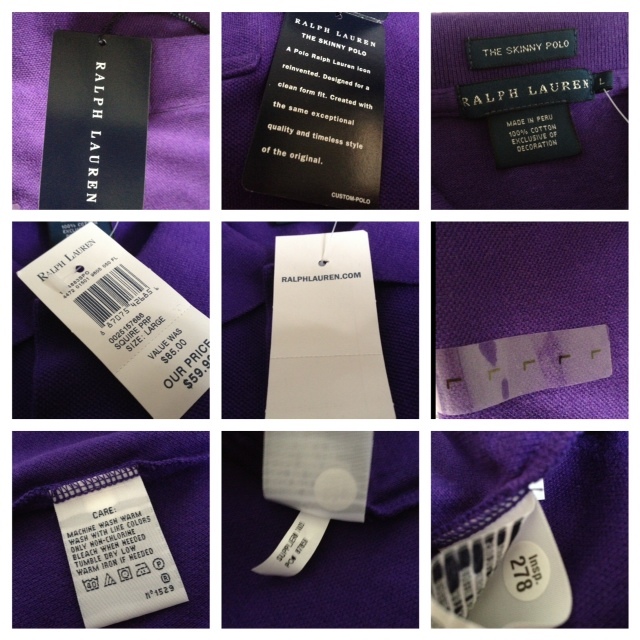 And it has The Skinny Polo label on top of the Ralph Lauren label. Outlet Price sells for $60+, plus more discounts. Few days after, in Carlsbad Outlet Stores, price was even further reduced. But I already had most of the colors available. Photos above detail on identifying an authentic Skinny Ralph Lauren Polo Shirts. I can't compare it with a copy, but I buy export overruns from other brands, you can tell that there was something off about them... threads are loose, stitches are uneven, buttons are not nicely sown, etc.